The Lismon Etteilla is of type Grand Etteilla II and was -according to Dummett- the work of Simon Blocquel, a publisher at Lille, who worked in collaboration with his father-in-law Jean-Baptist Castiaux. The two of them liked using anagrammatic pseudonyms such as Blismon, Z. Lismon, Zlismon, Buqcellos, Milbons and Monblis. A French biography of Blocquel can be found here. 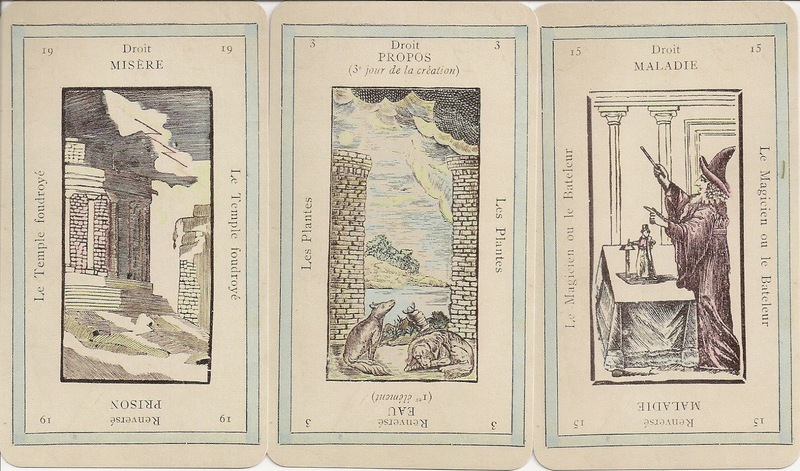 The first evidence for this deck was in a book called Le Grand Etteilla, ou l'Art de tirer les cartes published 1838 by Blocquel, which served to advertise his new version of Etteilla's cards. The authors name, Julia Orsini, maybe another pseudonym of Blocquel. 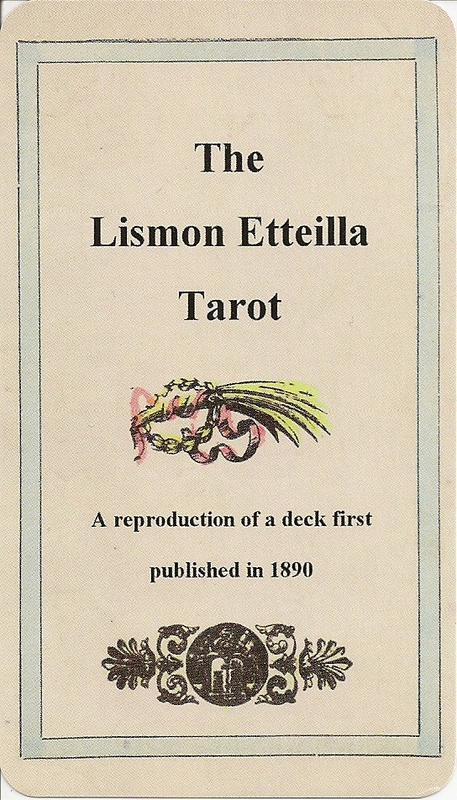 There were at least four editions of the Lismon Etteilla between 1838 and 1917, the oldest one (1838), which was mentioned in Kaplans Encyclopedia, has a misspelling of "Eteilla" on card number one, the following editions have the correct spelling "Etteilla". 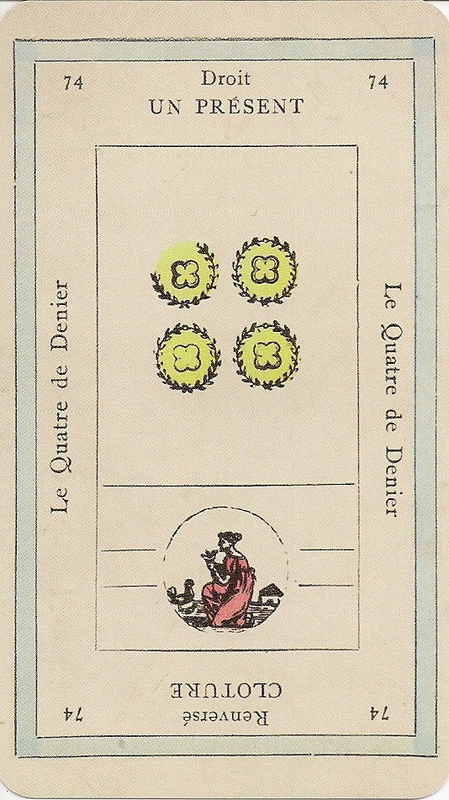 Tax stamps for playing cards in France were abolished in 1790 and return in 1890, lasting until 1917. Thus the tax stamp on the Two of Swords dates a deck between 1890 and 1917. 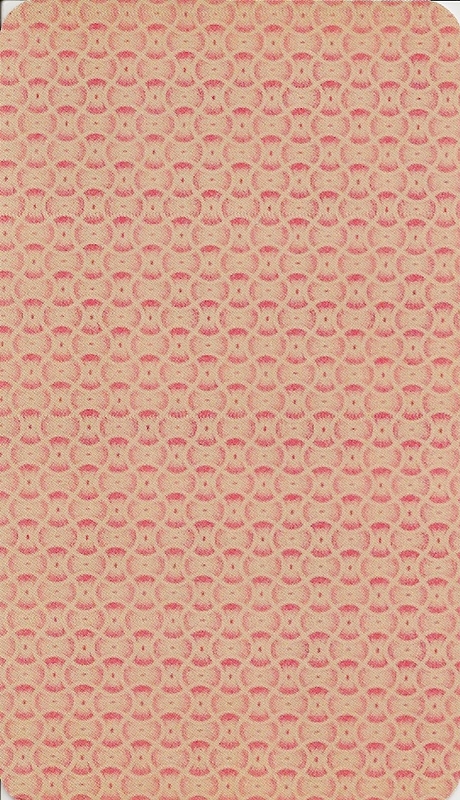 The second edition (e.g. see here) has a correct spelling of Etteilla, a complete upper left wreath on card #74 but no tax stamp, thus it dates before 1890. 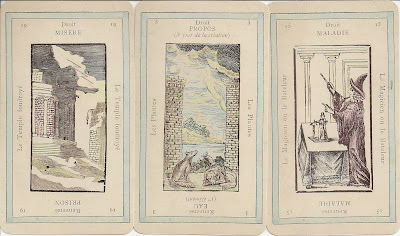 The third edition can be seen on the British Museum page, it has a tax stamp on the Two of Swords (thus it dates after 1890) and a complete upper left wreath on card #74. 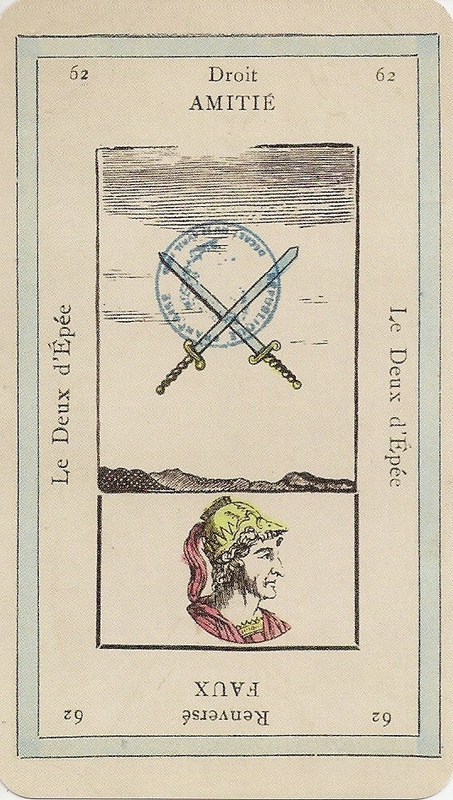 The fourth edition has a tax stamp on the Two of Swords and a missing part in the upper left wreath of card #74, possibly because the printing block has got damaged. The reprint by HistoricalRetrospective was from the fourth edition. 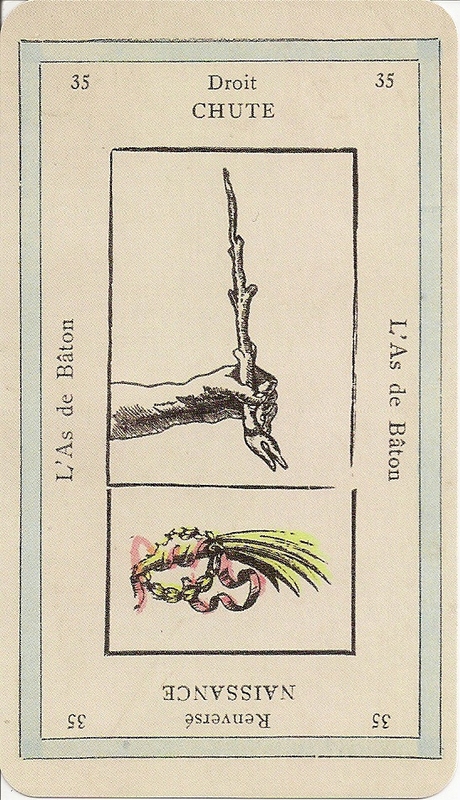 All Grand Etteilla II editions have on the Ace of Wands Chute or "Fall" as the upright and the reversed is Naissance or "Birth" (The 1900-20 Grimaud Etteilla ''corrects" this so that Birth/Naissance is the upright and Fall/Chute is reversed). 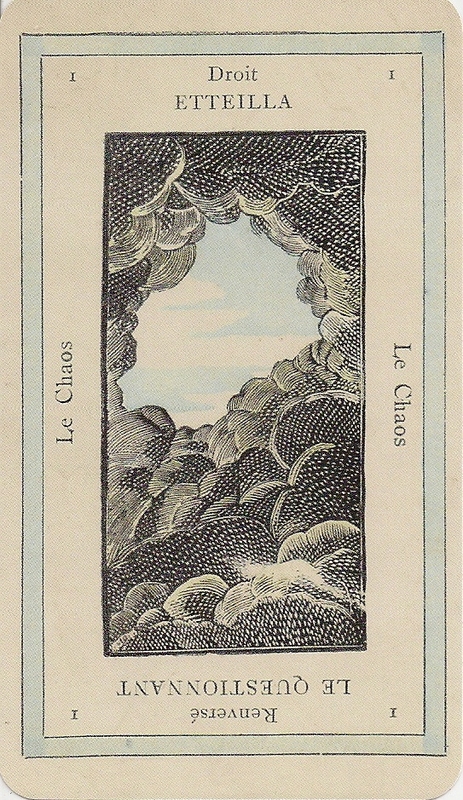 Grand Etteilla II was engraved on wood and did not diverge greatly from the original Etteilla deck. The titles are printed on both sides of the picture frame. Some images and keywords are different from Etteilla’s original deck. The Coins have become wreaths enclosing a quatrefoil. The lower panels on the numeral cards are new. The cards 1,10,12,15 and 21 have been redesigned.